Recently, a fire broke out near the Carr Powerhouse by Whiskeytown Lake, near where I live in Redding, California. It soon became a raging firestorm, torching its way towards homes and businesses in the city. It wasn’t long before a wall of flames a few miles wide could be seen from our back deck, and we learned that homes a mile away from us were being evacuated. Panic immediately gripped my wife and I, as we feared for our safety and the loss of our home. God actually created us with the capacity to fear, in order to protect us from doing things that would harm us. Fear can act as wisdom when it comes to dangerous situations that we encounter. Sometimes it’s just better to flight than to fight. When a wildfire is roaring towards you, it’s not wise to try and fight it, especially on your own with a garden hose. Sometimes it’s just better to evacuate. On the other hand, when you have the appropriate resources to fight a fire, your chances of containment and safety increase, and that can become incredible motivation to fight. Thankfully, our city’s and state fire departments had the resources to fight the fire to prevent it from doing even more devastating destruction. 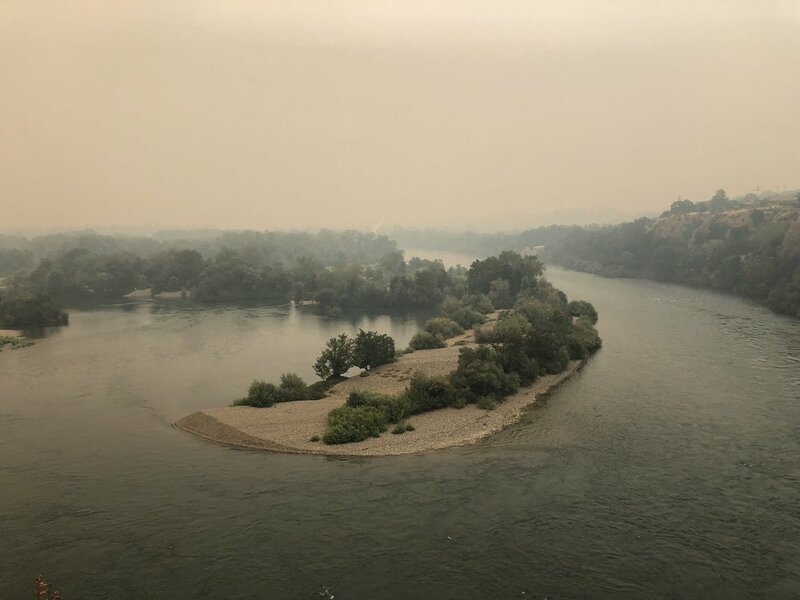 As the Carr Fire roared towards us, I found myself vacillating between fear and faith. It became a battle in my mind to trust the tools that God has provided to fight through the threat of uncertainty and impending doom. We can only successfully fight the fires in our lives when we have the right tools of faith. When we are faced with overwhelming circumstances and challenges in life, it is imperative that we have the right resources that enable us to overcome the fiery darts of the enemy. God rewards those who believe that He exists (Hebrews 11:6). We must not only believe that He is real and true, but also believe that He exists in the way that He truly exists. The Pharisees certainly knew that Jesus existed, but they didn’t believe the truth of Jesus’ identity and destiny. They didn’t believe in who Jesus truly claimed to be, and in what He could do to save mankind. God’s absolute goodness is true in the midst of the fire, and He will always work everything for good (Romans 8:28), and will always do good for us (Jeremiah 29:11; Psalm 119:68). God’s power is always able to do immeasurably more than we can even ask or think (Ephesians 3:20), and nothing is impossible for Him (Matthew 19:26). God is never desires that we experience defeat and destruction, but when we do, He is always willing to help us in our time of trouble (2 Peter 3:9; Psalm 46:1). Knowing these things help us find faith in the fires that seek to threaten our wellbeing, and keep us from our destiny. When we believe in who God truly is we will have confidence to stand up to the flames and declare God’s will in the midst of our circumstances and challenges in life. Jesus did not teach his disciples to plead a desperate petition of intervention, but rather to take responsibility as stewards of the Kingdom of God to declare God’s will. God’s will is always His Name. God has hundreds of names that describe His nature and character, which affect His behavior and actions — His will. God’s name is provider, which means that His will is always to provide. We never have to doubt whether or not God wants to provide for us because His name is Provider. His name is Breakthrough, which means His will is always for breakthrough in our circumstances, and challenges. When we declare His will, we are releasing God’s will to be done on earth, as it already exists in Heaven. In other words, our declarations are the conduits for God’s interventionary help to be released. God is not the destroyer, but rather, the savior, redeemer, healer, and deliverer. The devil always comes to kill, steal, and destroy (John 10:10) because those are his names, and therefore, his will. God’s will is always to destroy the works of the devil (1 John 3:8) through His supernatural resurrection power. When we declare God’s will on earth as it is in Heaven, our declarations make a difference, as we release His goodness and power to intervene on our behalf. When we were facing the flames of the fire roaring towards our house, we reached out to everyone we knew to stand with us in prayers of faith, declaring God’s will to deliver us from impending destruction. It’s the same way in the areas of our life in which the enemy has roared in to kill, steal, and destroy. When we are facing overwhelming odds in our circumstances and life challenges, it is imperative that we get the support we need. Large portions of the apostle Paul’s letters to the churches are filled with personal notes and acknowledgements to his friends in the Faith. In the times of trying fire, our friends can stand with us declaring God’s will for a good and prosperous future. Being part of a community also entitles us to utilize the expert resources represented in the various giftings the Holy Spirit made available (1 Peter 4:10; Romans 12:6). Fighting fires is best done with the help of the entire community. I am so glad Theresa and I invested so much effort over our life cultivating relationships with people who are friends in times of need. Two are better than one, because they have a good return for their labor: If either of them falls down, one can help the other up. But pity anyone who falls and has no one to help them up (Ecclesiastes 4:9,10). It’s never too late to start building community with people who you can do life with through good times and hard times. We find the power to fight the fires in our lives when people who encourage our efforts of faith, and declare the goodness of God into the circumstances and challenges we face throughout our lives support us. Miraculously, the fire turned away from the Redding city limits, and is now burning in the wilderness. Our home is safe, but we have many friends who have lost their homes. We are now joining them in their journey to rebuild from the ashes, and restore the promises that everything will work out for good in their lives. Theresa and I have been honored to come along side the brokenhearted to bring encouragement and hope in the midst of their loss and trauma. Theresa has been reaching out to the community through Creative Arts outreaches around our city, and I have been volunteering as a Grief and Trauma counselor for the victims of the fire. Our city has a long ways to go to see restoration, but as we work together, supporting one another in the fight of faith, we will overcome to see the glory of the Lord revealed in the midst of destruction. May you find faith to fight in the midst of your fires, so that God’s glory can be revealed in your life. Let’s keep the fire of God’s passionate presence burning in and through our lives. "We had a fantastic Firestarters course ending last week - we had about 100-120 people doing the course and it ignited so many lives - it was so exciting. Last Sunday, a lady gave testimony that before the course she never knew that she could pray for others and give prophetic words. Now she gives them out to people wherever she goes. Thanks for the Firestarters course! God is so good." "It was a great evening with 30 of us there - and a back instantly healed in response to a word of knowledge while we were receiving from God in the first 5 minutes!! The one healed was a nurse, who wants to believe in supernatural healing but finds it hard due to her professional training. Tomorrow we could gain a couple of extras who couldn't make it last week, and all those who came to "observe" are coming back committed to do the whole course! Praise God." "We are loving Firestarters. I think about 60 people have been through the program now and we’re seeing some amazing transformations. One lady who was really very shy is now totally on fire – doing creative writing, speaking out prophetically – she has totally changed and is loving partnering with Father! Lots of other people are now willing to step out in ways they didn’t before – encouraging people, looking for encounters with the Father out on the streets, and so much more! Last month we introduced another church to the program and they loved it too. Comments back from them were along the lines of, “Oh, it is actually easy to hear God speak!” and “Let’s do more of this in small groups.” Thanks for Firestarters. " Firestarters is going so well, people have been activated and really encouraged.....so good. More people are wanting to do it again so we are busy planning. Everything is in the book and you can make the activation and prophetic parts as fun as you like.....we have had so much fun. The guys who have done it this first time have said its been life changing!! So our challenge now is to run it on a larger scale and to inspire some of our initial Firestarters to help us to run it again. "It’s one thing to read about living in the Kingdom but completely different to actually live it in community. Theory has become practice. I previously didn’t realize His presence was so fun and joyful. I’m really not sure how to put this all into words. I came to Bethel Church to experience God, and learn to live in His Kingdom, and Firstarters has started it – given me the ignition I needed." "I would just like to tell you that we had the most amazing night last night at Firestarters. Most of the group had never had a word of knowledge prior to coming to the class. As we stepped out in faith, we got several words of knowledge, and most of them were miraculously healed on the spot. It was sooooo amazing, but the most notable miracle was that God either dissolved or bent (whatever He does) 11 SCREWS IN A FOOT. It was amazing because this lady afterward told us the extent of her injuries that I had not known before I prayed for her — that she could never stand on her toes and bend her foot before. Jumping up and down, she exclaimed to the class that next week she is coming back with high heel shoes on!!"